Aluminum alloy 6061 is studied after an ultrasonic treatment conducted at different vibration amplitudes in the casting process. The alloy is subjected to a diffraction analysis with processing of the spectra by the Rietveld method using the MAUD (Materials Analysis Using Diffraction) software. The texture parameters, the rms strain, the lattice parameter, and the crystallite size are determined by the Rietveld technique. 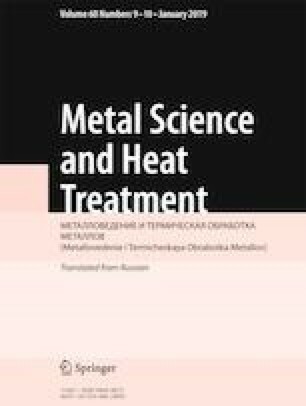 It is shown that the porosity of the alloy deceases considerably after the ultrasonic treatment, which also affects positively the texture of the alloy. Translated from Metallovedenie i Termicheskaya Obrabotka Metallov, No. 9, pp. 22 – 27, September, 2018.